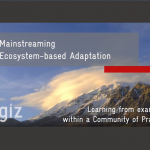 The video provides an introduction into the concept of Ecosystem-based Adaptation (EbA), practical country examples and the role of an international community of practice as an expert network to support mainstreaming into policies, plans and practical implementation. Part 1 explains the importance of ecosystems for people and its importance within environmental and sectoral policies at international and national level. Part 3 provides insights into the knowledge exchange formats of the community of practice. The video was published by Deutsche Gesellschaft für Internationale Zusammenarbeit (GIZ) on behalf of the German Federal Ministry for Environment, Nature Conservation, Building and Nuclear Safety (BMUB) under its International Climate Initiative (IKI). View the full video here: EN / SP.